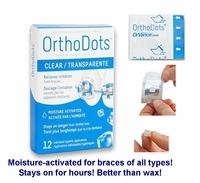 Where to buy dental wax for braces? 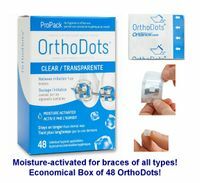 DentaKit.com has the best selection of products for braces on the web! 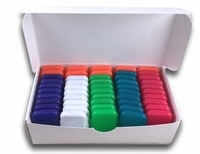 Get temporary relief when orthodontic brackets or appliances hurt your gums and the insides of your lips with easy-to-use dental wax or dental silicone. 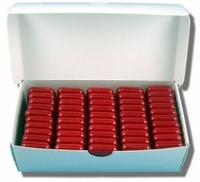 Just smoosh it on the bracket that is irritating the inside of your mouth, and you will get instant relief. Dental Wax and Dental Silicone are not the same thing. 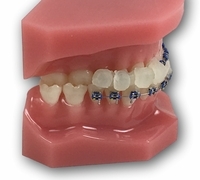 Dental Silicone (Brace Gard, Ortho-Sil) last longer, but your brackets need to be totally dry for the silicone to stick. 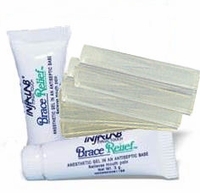 Try the new Brace Relief Pocket Kit with extra-thick silicone strips and analgesic gel if you want a convenient kit that contains dental silicone!